Today, September 10 is World Suicide Prevention Day. 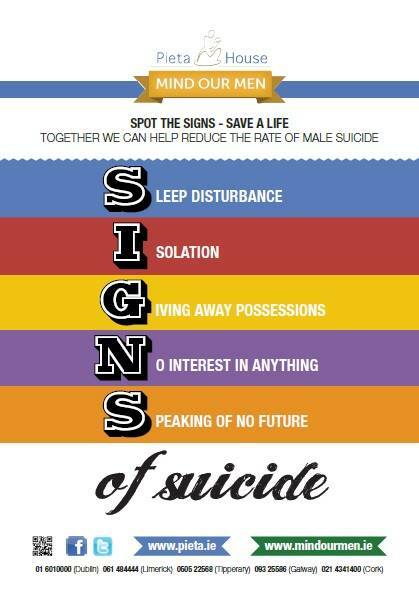 An Irish suicide awareness organisation Pieta House has issued the following image to help people recognise the signs of impending suicide in others. Remember, suicide can happen to anyone. If you are in any way concerned that someone you know is considering suicide do not be afraid to ask them outright. Do not be afraid to use the word ‘suicide.’ Using the word does not make someone who is not suicidal become suicidal. However being afraid to use it, or fumbling for an alternative can add to the taboo and the moment can be lost. If you are thinking right now that there is someone who may need you to ask the question of but you are uncomfortable with the words, practice saying it out loud first, so that you can say it more easily. If you can see one or more of these signs in someone, you may well be the only person they are subconsciously communicating that signal too. As long as they are alive, there is hope that they can be helped. Dig deep, find the courage to be the one to take them by the hand and lead them to professional help. This entry was posted in Non-fiction and tagged Feeling suicidal, helping someone who is suicidal, Pieta House, Signs of Suicide, World Suicide Prevention Day. Bookmark the permalink. 1 Response to Any of this feel familiar? It might be a hard question to ask someone, it might be a hard conversation to start, but not saying something may lead to even harder consequences to live with. A very important post, indeed.